RESEARCH NEW TECHNOLOGIES, EXPAND YOUR FLEET, LEAD A UNIQUE FACTION. Having found shelter in the Proxima Centauri system, after encountering a mysterious alien race who became mankind's allies and protectors, powerful human factions are once again at odds with each other. After the Centaurians' sudden departure, left alone in the universe, humanity once again fractures, as old grievances and new conflicts threaten to tear the galaxy apart. Renewed struggle for power brings to bare new weaponry: from unique skills developed by each of the factions during the prolonged space flight, to special technologies only some are able to access. War stirs again, and this ultimate conflict will decide the fate of humanity, bringing it once again to the Edge of Extinction. 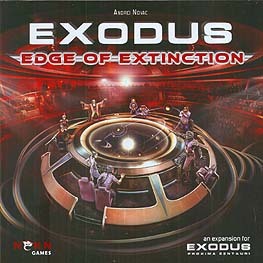 In Exodus: Edge of Extinction the bitter conflict between six factions returns, with new faction-exclusive special abilities and new technologies. Each player will build a larger fleet of fully customizable ships and develop new special technologies to face off against other players and a host of new Centaurian Resistance. Each faction will try to play to their strengths, utilizing all new exclusive action decks, flexing political muscle while bidding over new political cards and going to battle with a hand of rule-altering combat cards. Will you be the victor, or will you bring your people over the Edge of Extinction? Requires a copy of Exodus: Proxima Centuri Revised Edition to play.